Tangled and True: print, pattern, paper. I'm a big fan of children's art. Print, pattern, paper always has vibrant art that appeals to kids and adults. 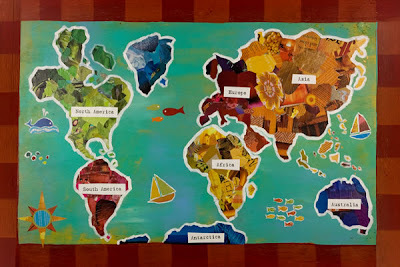 They've recently introduced 18x24 sizes in their alphabet, number and world map designs. As always they are made from 100% recycled fibers and soy ink. love it! I'm looking for art for our kids new rooms, and especially somthing where we can talk about where we live (germany) and where our other friends and family are across the world. That's such a fun map- way cuter than the traditional blue and green ones. i agree. children's art is simply the best sometimes!